(CNN) - A major conservative group rolled out a new ad buy on Wednesday, spending $4.7 million on spots that target Democrats running for U.S. Senate seats. Crossroads GPS, the private arm for the Karl Rove-backed super PAC American Crossroads, said they will run ads in Nevada, Virginia, Missouri, Montana, Ohio and Wisconsin. Democrats currently hold a 53-47 advantage in the Senate, but they are defending 23 (21 Democrats and two independents who caucus with the party) of the 33 seats up for grabs in November. The six states targeted by Crossroads have some of the most heated Senate races in the country. The ad campaign is part of the group's "New Majority Agenda," an initiative with the aim to help the GOP retake the Senate. Among those on their list is Wisconsin, where former Gov. Tommy Thompson emerged as the state's GOP primary winner on Tuesday. The Wisconsin spot takes aim at Thompson's opponent and Democratic candidate, Rep. Tammy Baldwin, and blames the congresswoman for contributing to the increase in federal spending. Former Virginia Gov. Tim Kaine is the subject of two new ads by Crossroads. One of the spots hits Kaine for "higher taxes, reckless spending and skyrocketing tuition," while another attacks the candidate over defense spending. His campaign responded Wednesday, blasting the ads as "false" and sending out an email to supporters to fund-raise off of the new spots. "In the face of three new attack ads, it's going to take even more than our great work in the field to be able to spread Tim's message through the onslaught of attacks. That's why we need your support today," read an email from Kaine's campaign. Rep. Shelley Berkley of Nevada, incumbent Sen. Claire McCaskill of Missouri, incumbent Sen. Sherrod Brown of Ohio, and incumbent Sen. Jon Tester of Montana were also targeted in the new slate of ads. 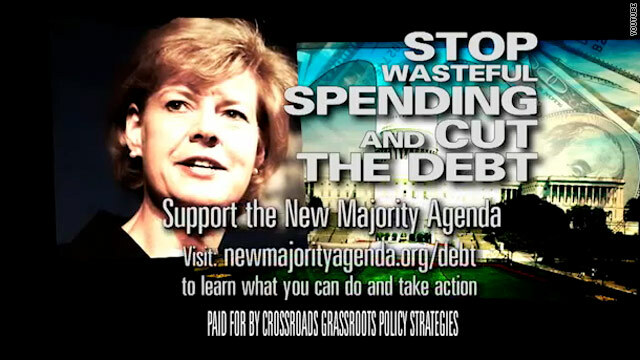 The Democratic Senatorial Campaign Committee, however, released its own video Wednesday to counter the latest wave of commercials, describing Crossroads' "New Majority Agenda" as "A Dangerous Agenda." The one-minute web video highlights Republican Senate candidates in many of the same states and argues they aim to cut Medicare benefits, slash Social Security, repeal Wall Street Reform and give special tax breaks to the very wealthy. "Voters need to know that no matter what Republicans say on the stump, this will be their agenda in the Senate," said Matt Canter, spokesman for the DSCC. "It is time to hold Republican candidates accountable for Karl Rove's so-called 'New Majority Agenda,' which would gut Social Security and Medicare in order to pay for more tax breaks for billionaires and Big Oil." A lot of comments here seem to be from people who must have slept through the Bush administration. I haven't seen these ads, but I hope the Republican Party doesn't sink to the level of some of the democrat super pac ads. However, if they wanted to, they could end every attack ad with... "and democrats cause cancer." Money well wasted Karl! Keep spending. I find it appalling that these donors can spend uber amounts of money in political campaigns, but they can't find some loose change to pay more taxes? That just doesn't add up(pun intended).